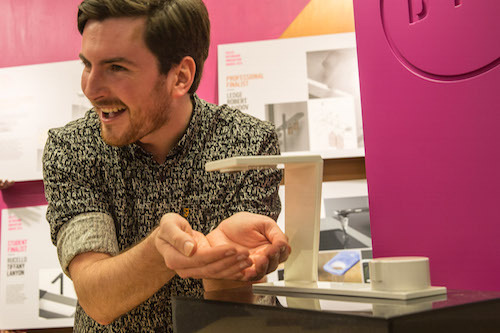 2013 Bachelor of Industrial Design graduate Michael Wilds has just received a national Bathroom Innovation Award (BIA) for his sustainable tap design. Celebrating its tenth year in 2015, the Bathroom Innovation Award (BIA) is the only bathroom competition of its kind in Australia, providing student and professional designers with invaluable career opportunities as part of its impressive prize packages. 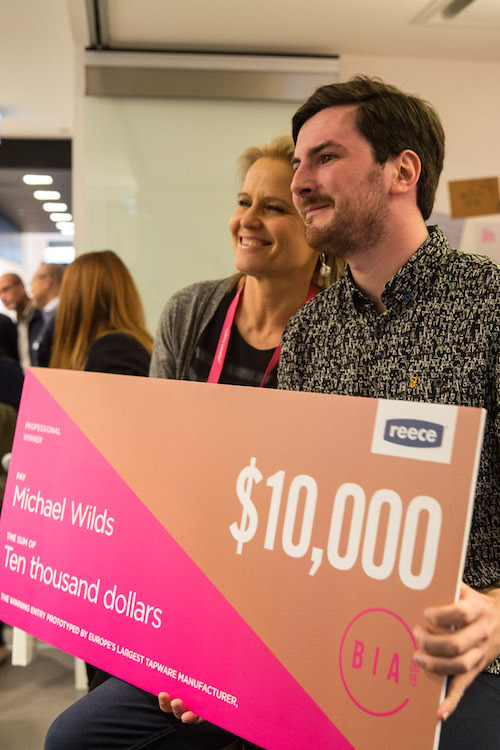 Michael has been named winner of the professional category, receiving a $10,000 cash reward and the opportunity to have his tap design prototyped by Italy's largest tapware manufacturer, Nobilli. His winning design, the Incline, combines sustainable water-use features and a refined sculptural form to create a functional tap. "The main idea behind Incline was to design a sculptural yet functional product for the bathroom, a talking piece that aimed to promote sustainable water use," said Michael. "I wanted to create an interesting form that was simple but unique. It also had to include sustainable features, which had to be taken into consideration when designing. I knew I wanted a timed tap feature, and it was a good challenge working out how to incorporate this seamlessly into a single mixer tab," he said. Michael is passionate about sustainability and believes it should be a key feature in all bathroom designs, "by educating and putting into practice sustainable living skills in the bathroom, people can carry that thought process into other rooms of their homes and their daily lives." In Michael's tap design, the main sustainable feature is a timed mixer with a visual countdown element that changes the way the tap is used, "it's a simple yet effective feature that doesn't detract from the design aesthetic," said Michael. Users are more conscious of time as they use water, the visual cue of the countdown encouraging users to complete water tasks more efficiently and thoughtfully. The winners were selected by BIA's panel of nationally and internationally renowned judges including Amanda Stanaway, James Harper, Justin Wagemakers, Josep Congost, Shaynna Blaze (pictured), Roberto Palomba, Lorenzo Logi and Daniel Dalla Riva. Find out more about the awards on the BIA website. Discover the Bachelor of Industrial Design at UON.